On March 3rd, 2010 I arrived in Ushuaia, Argentina and ended my journey to the southernmost city in the world. On July 25th, I left for Prudhoe Bay on the north shore of Alaska to begin a solo bicycle journey 15,000 miles south along the Pan-American Highway to Tierra Del Fuego, the bottom of South America. I traveled through the vast Alaskan wilderness, into Canada and crossed into the forests of northern Washington. From there I followed the coast down, all the way through the deserts of southern Baja, where I took a ferry to the mainland. I continued to follow the coast south through the rainforests of Guatemala, El Salvador, Honduras, Nicaragua, Costa Rica and Panama. Then came South America: Colombia, Ecuador, the endless deserts of Peru, Northern Chile and then finally Argentina. I will ended in Ushuaia and the bottom of the Americas. This ride is a reminder of what can be accomplished through perseverance and a little hard work. It’s a reminder of what we as people are capable of, of what the human mind, body and spirit can achieve. I hope that I can help people realize that while it may take time, and it may be harsh and lonely at times, we can make our lives how we dream them to be. I do not want to be guilty of owning a life devoid of any living. Comfort and convenience are not synonymous with happiness! For some reason I am under the impression that I will find both myself and God somewhere along this road. Maybe I won’t find either, but I must look! I want to allow the light of introspection a pure and undiluted chance to examine my soul. I have found greater value in thoughts born in solitude than those that spring from the fray of ordinary life. I hope this trip will be the beginning to a life full of experience, beauty and understanding. I don’t ever want to forget the way the world felt when I was a child: magical and huge, full of possibility and hope. I won’t let go of that. I am an artist at heart, and this, I hope, will be my first great work. 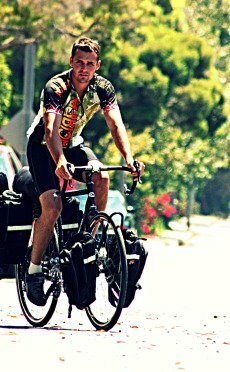 I am riding to raise awareness for 'Acirfa,’ a non-profit organization which provides quality bikes to the people of Zambia, giving them the means to help themselves, rather than depend on charity. A bicycle changes the life of a Zambian in ways that are difficult for Americans to imagine, allowing doctors to see more patients, parents to make a living and teachers to get to school. To clear the air and clear your head, ride a bike once a week! On Facebook? Join the Earning the Horizon group! the story of the change through that thing. Churches, for instance. about the changing landscape and culture would be represented. places and I better understand the beauty of travel. Email addresses are not shared. Unsubscribe at any time. Be part of this journey with me... Donate today and help bring lasting change to people in Africa through transportation and mobility with my nonprofit partner ACIRFA (a.ker.fa).